This card is entered into this month's Crazy Crafters Team Highlights. So see all the entries and vote for your favourites, click here. I fell in love with this stamp set as soon as I saw it and I know I'll be using it a lot in the future! It ticks all my "beautiful and versatile" boxes! Beautiful Promenade in Navy and Mango - inspired by someone's scarf! This colour scheme was inspired by a scarf that I saw someone wearing the other day and admired - you just never know when or how inspiration is going to strike. To the base card of Night of Navy I added a layer of Mango Melody and then decorated the top layer of Night of Navy before adhering it to the card front. Most of the elements are gold heat embossed directly onto the card front. The two flowers were black heat embossed, watercoloured with Pumpkin Pie and Cajun Craze ink and fussy cut (because I'd forgotten about the coordinating Beautiful Layers in the bundle!) before I adhered them into place. 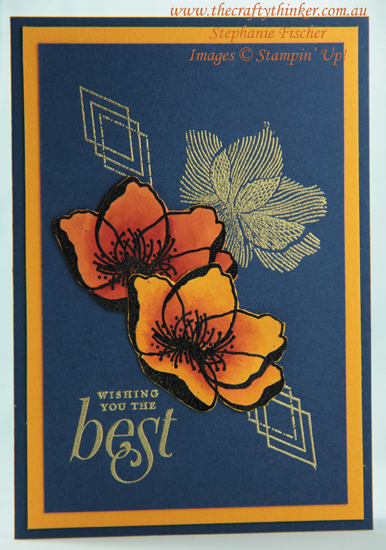 One of the flowers is cut from Mango Melody cardstock and the other from Pumpkin Pie.